Clean and shine your furniture cheaply and naturally. Homemade furniture polish can help keep your tables and chairs looking glossy and clean, and you don't have to keep buying and disposing of aerosol cans. If using something homemade with ingredients you know and understand, you don't have to wonder about the chemicals that lurk in commercial furniture polish. The best news is that you can do this easily and for far less money than you'd spend on store-bought furniture polish. Inexpensive: You can make polish with ingredients you may already have on hand, especially if you have a lemon tree growing in your backyard! Chemical-free: These recipes use nature's own cleaning chemicals that are, in fact, food items you'd use on your salad. No fragrances to irritate allergies: The cheap scents used in commercial furniture polish can trigger allergies in many people, or even in your pets. Instead of stinky fake perfumes, you'll enjoy the clean scent of lemon. Environmentally-friendly: You won't have any aerosol cans dispersing propellant and needing disposal. You can mix these fresh in a bowl or use your own spray bottle. Like the names says, this recipe has only two ingredients: white vinegar and lemon juice. Combine equal parts of both in a bowl or spray bottle. 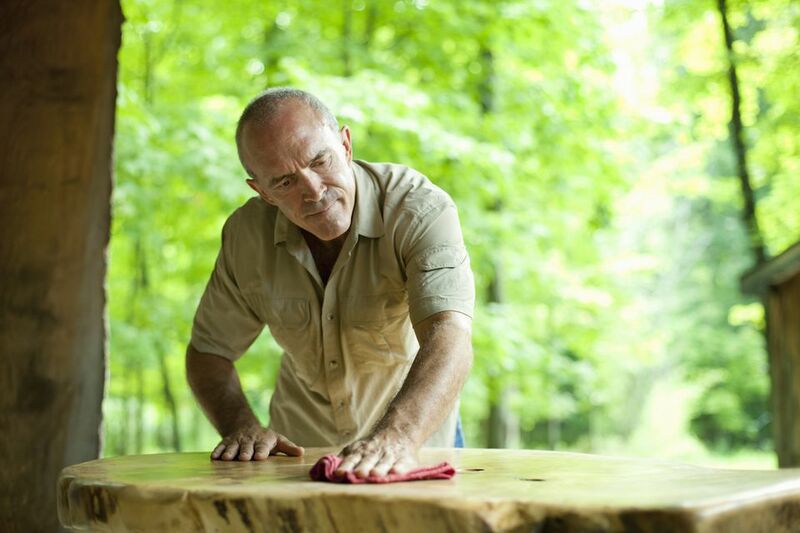 To use it, use a clean cloth to rub a small amount of the polish into your furniture, then wipe dry with another cloth. You can make this fresh for each use. Like its counterpart, this also contains only two ingredients: olive oil and lemon juice. For this, though, combine two parts olive oil and one part lemon juice in a bowl or spray bottle. As with the other recipe, rub a small amount into your furniture with a clean cloth, then wipe dry with another cloth. It's best to make this fresh for each use because it can go rancid. Do not reuse spray bottles that have contained other chemicals. While vinegar and lemon juice are natural food products, they are acids that could combine with residues of other products in unpleasant ways. You don't want to spray your furniture with that. Label the spray bottle or container with what is inside and the date that you made it. You don't want mystery bottles, jars, or plastic containers in your pantry or under the sink. Shake before each use to recombine ingredients. Just like salad dressing, the oil and lemon juice will separate. Cheap olive oil works just as well as more expensive grades. This also is a good use for olive oil that is getting old or was shoved to the back of the cupboard. It may not taste great in your food, but it can polish your furniture. These ingredients should be safe around children and pets, but it is always best to store spray bottles and cleaning products securely. You don't want to encourage them to play with any cleaning product. The next one might not be so benign. What Kinds of Furniture Can Be Salvaged After Flooding?